Xidax Now Offers Affirm Financing! 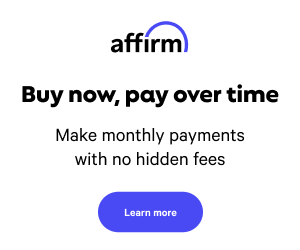 Pay over time for your most important purchases with Affirm. Enter a few pieces of information for a real-time decision. Checking your eligibility won't affect your credit score. Apply for Affirm at checkout! Prequalify now! At Xidax we're proud to offer our exclusive No Credit Required Leasing. Now with no credit required leasing, owning a new hand-built Xidax desktop or laptop gaming computer is easier than ever! -Must have valid Social Security Number or ITIN. -Have routing and account numbers for an open and valid checking account. -Have a Credit or debit card. Q : When is my first payment due? Q : What is the interest rate? How is the monthly payment figured? Q : How long is the agreement for? A : All lease/purchase agreements are for 12 months unless you wish to pay off the purchase early. Q : Can I pay off the purchase early? A : Yes! And when you pay off your invoice amount within 90 days you only pay an application initial payment. Q : How much can I get approved for? A : The maximum you can be approved for with No Credit Needed Leasing is $2,500. Q : If the computer I want is more than I was approved for, can I pay the difference with a credit card? A : Absolutely. You can either pay the difference with your credit card or PayPal account. Q : Will I be charged anything when I submit an application through the website? A : You will only be charged when you have been approved and signed the purchase agreement online. Q : I was approved, what's next? A : Call us at 1-877-943-2972 and we'll complete your order!